The Premier League is less than a week old but already it feels like it has never been away. The transfer deadline was brought forward to before the season kicked off, meaning no players can now be added once the season is underway. So now all fans know what their Premier League squad is, unless players are loaned or sold abroad in the remainder of this month (in the case of most major leagues), or loaned to clubs in England below the top tier. Sky Sports have analysed all the Premier League squads and came up with some interesting comparison between the 20 clubs. The youngest squads are Wolves 24 years 8 months, and then Southampton, Everton and Fulham at 24 years 9 months. As for oldest, you have Burnley 28 years 0 months, Brighton 27 years 6 months and Cardiff 27 years 3 months. Newcastle United sit right in the middle on 10th, at an average 25 years 9 months. The tallest squads are Watford 185.4cm average, then Huddersfield 184.7cm. As for shortest, Man City 179.7cm and Bournemouth 181.2cm. Once again Newcastle United sit right in the middle on 10th, at an average of 182.9cm. The most English squads are Bournemouth 64%, Southampton 55% and Cardiff 52%. As for least English, Arsenal 15% and Huddersfield 19%. Newcastle United once again around middle with the 9th most English squad at 33%. 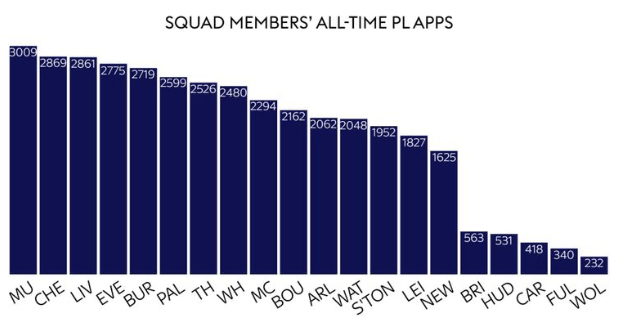 As you can see, the most experienced squads in terms of Premier League appearances are Man Utd 3009 and Chelsea 2869. As for those with the least PL appearances, you have Wolves 232, Fulham 340 and Cardiff 418. Newcastle United are 15th this time with 1,625 PL appearances between them. The stand out thing here is that the three clubs most recently promoted are the very bottom three, then the next three promoted before them (including Newcastle), are the next lowest. For Newcastle United it suggests that we have a squad which is in the middle/average in terms of height, age and proportion of English players. Though towards the bottom when it comes to Premier League experience. What they can’t measure is ability (nor in this case is it talking about money spent) and lets hope Newcastle United prove to have enough of that.